How to copy and insert a chart in the same worksheet using C#,VB.NET? This article explains how to copy and insert a chart in the same worksheet in XlsIO using C#/VB.NET. 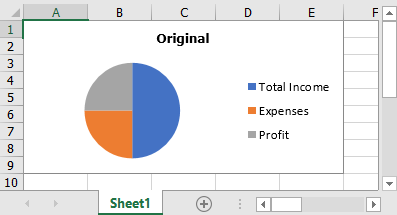 How to copy and insert chart in same worksheet? When a chart with same formatting is to be applied for different charts, there is no need of creating a new chart every time. Instead, we can copy the existing chart and make use of the cloned chart. This can be achieved by cloning and repositioned the chart in the worksheet. To copy and insert a chart in same worksheet, you need to follow the below steps. Create a workbook and add chart data in it. Add a chart in the worksheet. The below screenshot shows output of the chart created using the above code. Then clone the chart added and set the positions for the new chart. Add data for the new chart. To know more about working with charts in XlsIO, please refer the documentation. The following C#/VB.NET complete code snippet shows how to copy and insert a chart in the same worksheet in XlsIO.